This is definitely looking bubbly. The yield on the 30-year bond has now fallen to 3.2%, the lowest on record going back to 1977. This is unprecedented. The ProShares ETF has been available only since May of 2008 but it looks like the timing is perfect. Investors have not been afraid to trade this ETF, with volume today, for example, running over 2 million shares. 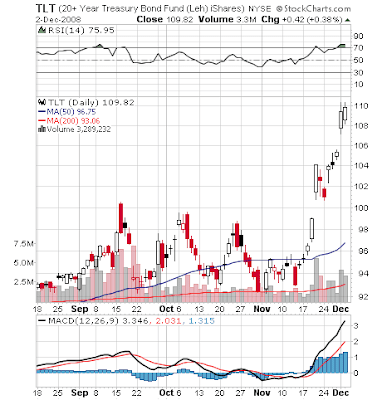 The ETF has plunged as TLT has rocketed upward and gets cheaper by the day. Right now, bonds are benefiting from the flight to quality trade. Each time another shoe drops in the stock market, bonds get bid up even further. In addition, Ben Bernanke has suggested more rate cuts are in the offing and that the Fed may at some point actually begin buying long dated bonds in the open market. This has created a very bond-friendly environment. On the other hand, bonds will eventually be subject to price pressure when supply drastically increases as the government works to pay for the various bailout and stimulous actions being taken to fight the current economic downturn. The current abnormally low yield can be expected to revert to its mean. At some point, stocks will bottom and the flight to quality will reverse, reducing demand for bonds. As these events play out, the bond bubble will burst. It seems that we aren't too far away from our next bubble-busting event, this time in the bond market. It would be worthwhile for investors to keep a close eye on both of these ETFs and perhaps consider building a position in the ProShares UltraShort ETF. 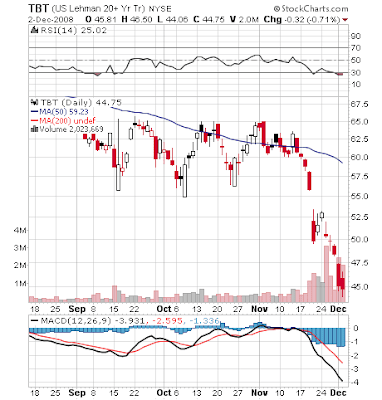 When TLT begins to crumble, it's liable to go quickly.